Does anyone have any tips for working around the less than pleasing aesthetic of a screen door? 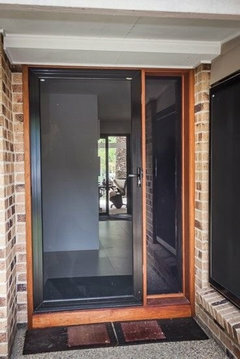 I'm not sure if this is a universal trend, but around Qld, most people choose not to include a screen on their front door anymore bc they spoil the designer doors that are now ubiquitous with new builds. - It is completely impractical to leave your front door closed if you are trying to catch a skerrick of oxygen on a humid or simply damn hot Summer's day. In fact, our hallway will deliberately catch the southern breezes. We are not installing air con until we've lived in the house and we are not the kind to put it on below 34/35 degrees anyway. I'm not particularly good at dealing with flies if I simply leave the door open. 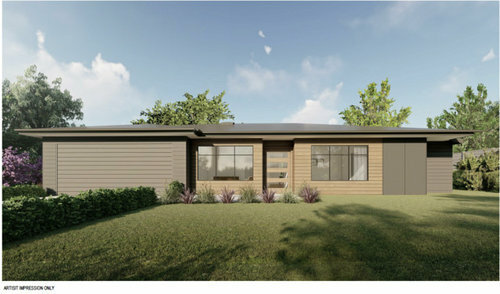 Plus: small kids + open front door and no front fence is an obvious no no. Has anyone come up with a solution to this tension between design and function or do you have any style tips that may lessen the impact on the front aesthetic? I'd really appreciate hearing from people who have actually dealt with this issue in our Qld climate. Cheers and thanks again! I'm so grateful for any suggestions. Colours haven't been determined yet, so there's still time to maybe tie in the screen colour to other trims.. 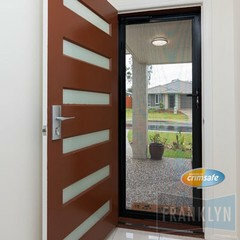 I agree that it is great to leave the front door open to catch that cool breeze and fresh air, have a look at Crimsafe doors, they are practically invisible and they are the best security door and they won’t hide your lovely front door. Thanks so much both of you! Looks like I'll have to address this down the track and continue as is with a screen less build for now. Crimsafe would be on my dream list, but not my current budget. They do look pretty good though, especially where I can see the door closed behind the screen, Julie Herbet. I'm just so relieved we narrowed our hallway a little in favour of a regular door. 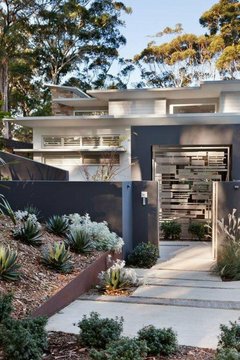 Originally hubby wanted the gigantic 1200mm pivot door - gorgeous, but incapable of screening those ones. I think he made the right choice, not only for being able to screen the 1000mm door down the track, but also to gain an extra 20-30cm of space in our MPR. So much to consider from one small decision. Agree, I have crimsafe on my front door. Allows the door to be seen. Airconditioning. There is no such thing a good looking screen door. I hear where you’re coming from Gallifrey, but there’s also nothing like a great natural breeze. That costs nothing! In my opinion Crimsafe is ugly. There has to be another solution. Putting Crimsafe over a great door or window is a crime. In this world we live in I think safety is the major priority, at least being able to open the door and having the security of a crimsafe door instead of having nothing between you and the person on the doorstep is a safer option plus the added bonus of free breezes is a win also. Would a retractable screen door be suitable? I went to a house recently that had double entry doors and I didn't even notice the screen door frame that was installed. Wow! Haven't heard of these. Must research... Thanks for the hint. Hi. Also in Queensland. 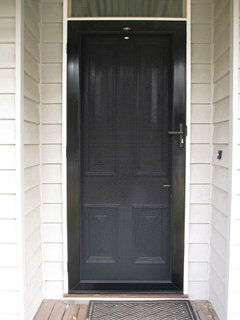 I agree that security window and door covers do look a bit drab but are great protection if that’s what’s needed. And those older style screens can look like weird fishnet tights stretched over every opening. Where we are in Brisbane, flies aren’t really an issue (for some reason they will however all appear when I cook roast lamb or our daughter’s dog visits with its pongy dog food!). But evening mosquitoes and midges are a problem and potentially the greater health risk. 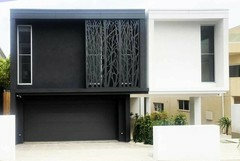 So during the day, a non screened security door keeps the air flowing through the house but keeps it secure, the attractive door is visible and the house doesn’t look as closed up. Screened doors do seem to block a lot of that breeze. By night doors are closed and we use the barred casement house windows for ventilation, with magnetic screens fitted internally, though retractable ones would be lovely. But I confess, did love the a/c this summer. Have a look at Axolotl - they only work in metal concrete and glass and have the best screens for our times. Look at axolotl.com.au I just tried to gather some images together, so you might get 2 lots. Thanks Weaver Interiors, they are lovely. But I don't think what I'm looking for - need to screen a door, rather than a space. Yes, brizcs - this last two months were oppressive indeed! A/C would have been very welcome over here! And it's coming up more and more in our discussions of what to do to the house more urgently after we move in!! Sorry swich5 these were just examples of what they are capable of. I contacted them initially to re-dip an old brass coffee table for a client (how basic is that) which was when I was blown away by their design expertise. 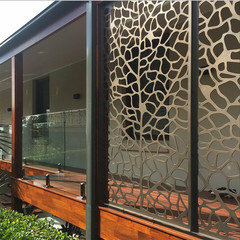 They also make screen doors, garage doors, concrete tables with floral designs, fences - anything metal, concrete or glass and best of all - AUSTRALIAN. Expensive but well worth it forever. They designed a screen door for me to keep a cat in - it was a penthouse and a very pampered pus. 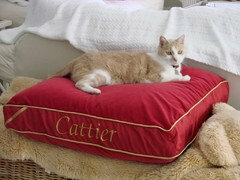 We also made the cat a velvet cushion called CATIER - as in CARTIER which had to look like the Cartier gift box. Oooh, thank you for the information here, I would love to paint my front door a lovely bright turquoise colour but it seemed pointless with the cream "fishnet stocking" patterned screen door. The Crimsafe door might be my answer, I just like to have something between me and a caller. Be aware too, while these doors might be more expensive to buy, having such a door can help reduce your annual house insurance premium. When insurance premiums are based on crime rates, in individual areas there can be significant savings. At least the Crimsafe doors won't take from any design features. 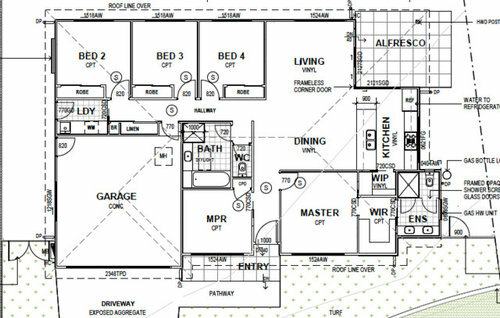 What I will throw into the discussion is that you could put your screen door further out in the Entrance area (there seems to be half a metre or so in the photograph) and if they were double frames could latch back when required, rather than one large frame taking up all the space. Just ensure the area is covered, so visitors son't cop a deluge awaiting access. For added security, bolts could be attached to one side top and base and the other frame do most of the swinging. That's a different idea...worth pondering. Thanks Weaver Interiors! I know if it's not crim safe, "it's not crim safe", but my budget did not extend to that brand. Other companies do similar products, and far cheaper. I installed crim security on sliding doors, and back door and faced the dilemma about the front door which I didn't want to cover up either. Currently we have left it off as we don't use the front door yet, so it stays shut. I'd be interested in the retractable ones too.